At one stage Denniston had a population that could justify having its own lodges, churches and sports clubs. 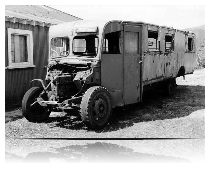 It had its own RSA, its own Orange Lodge, and many other organisations and even at one time had a few pubs, the last of these, the Red Dog Saloon at Burnetts Face, closing in the 1960s. With the ground being too hard to dig graves, the deceased in early years were often shipped down the Denniston Incline to the cemetery at Waimangaroa. Later, when the road was constructed, it made things easier on the people living and working on the “Hill”. However in its early days, Denniston’s communities were well and truly isolated, the incline and the skipways forming the only real means of transportation around and off the plateau. Denniston was the location where coal from mines on the Denniston Plateau would come to be sorted and dispatched into "Q" Class Hopper wagons for shipment to industry. The wagons would descend the famous Denniston Incline, and the Incline is where Denniston gets its noteworthiness from. The Denniston Incline was a steeply graded incline railway that linked Denniston with Conns Creek, the railway terminus at the bottom of the incline. The Incline fell 510 metres in 1.7 kilometres with some sections having gradients over 1 in 1.3 Westcoast.org. The track gauge was the standard NZR track gauge of 3ft 6inches and the system was designed to provide coal for coal ships at Westport. The wagons used on the incline were the ubiquitous “Q” class hopper wagons that could be detached from their wagon bodies and lifted by wharf crane over the hold of a ship, and the bottom discharge doors of the wagons opened manually to discharge coal into the ships' holds. Thus it would appear that the whole system from start to finish was designed around the mass production principle. The 'Incline' was actually two inclines. The first of the two began at the top at Denniston, and descended steeply until it got to the appropriately named "Middle Brake". Here the wagon was disconnected from the first incline's rope, and placed on the rope of the second incline for a more gentle descent to Conns Creek, where the accumulated wagons would then be marshalled into trains to be taken to the port of Westport for unloading into coal ships. The Denniston Incline worked by means of gravity operation. One loaded wagon of coal going down the Incline would pull an empty wagon up. The braking system of the winding drums used water to slow the pistons of the drums. One of these drums, the drum from Middle Brake, can be found at Westport's coal mining museum, Coaltown. The two Inclines were single line operation with passing loops. It was at these “passing loops” where the empty and full wagons were expected to cross although this was not always the case as can be attested to by former incline staff, their recollections of head ons and near misses being backed up by the few wagons still lying beside the incline formation that never made it down the line because of head on collisions. The Locals and employees had a slang for the up and down tracks of the incline: The Up side was known as the "Donkey Side". The down side was known as the "Company Side". A wagon going down would come down the “company” side, pulling an empty up the “donkey”. 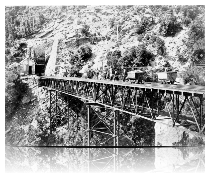 The incline had many accidents and a number of workers or people traversing the incline route in its era of operation died as a result of collisions and runaways. Denniston was always a working town, its life was the coal. 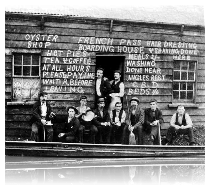 The community at Denniston served no other purpose then to support the operations of the coal mines and the incline. Once the road was put through people started to drift off Denniston to the warmer climate of Waimangaroa since the weather on Denniston it is said is not for the faint of heart and is not the place many would consider to be an idyllic existence. The first of Dennistons communities to suffer the pinch were quite naturally the smaller settlements such as Burnett’s Face, the town half a mile up the plateau, whose main road was the constantly running narrow gauge skipway linking the coal face with the Bins at the head of the Denniston Incline. Burnetts Face was always a rough and ready outpost on the edge of civilisation, and by the 1950s little remained of the settlement. The skipway which had been used to convey coal from the mines to Denniston since the early days of the Denniston Incline, was replaced in 1952 with an aerial ropeway. By the 1960s the writing was on the wall for the Denniston Incline and the decision was taken to close it by 1969, the actual last day of operation being 16 August 1967. 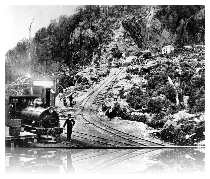 The Conns Creek branch which connected to the foot of the incline was cut back to a siding about 1 mile long where the coal was loaded from trucks. A few months later the aerial ropeway from the mines also closed down in favour of direct trucking of coal from the mine to Waimangaroa. 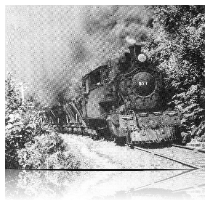 In May 1968 the Inangahua earthquake caused much damage to the incline making the closure irreversible. 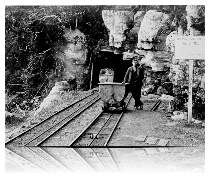 With declining coal markets, and the fact the system was almost entirely reliant on the outdated "Q Class Wagons", it was seen to be more cost effective to truck any remaining coal from the plateau down the hill via the public road, rather than rebuild the Incline. Thus what was once described as the "Eighth Wonder of the World" by locals, faded into history. An estimated 12 million tons of coal was carried in the incline's working life. You would think that would have been the end of Denniston, and it pretty much was, although the end of the incline didn’t necessary mean the end of mining and some coal mining activity remained on the plateau all be it with the output being trucked down the hill. The Incline’s remains and the formidable community of the Denniston Plateau slowly diminished over time following the closure of the incline in 1968, the relics of the past slowly disappearing, however interest in Denniston has continued to grow, and this growth and interest in Denniston has been aided by a recent novel entitled “The Denniston Rose”. With recognition of the historic nature of Denniston and its increasing status as a local tourist icon and one that is close to Westport, attention was needed immediately to ensure that was left of the settlement and its coal mining past wasn’t completely lost forever. 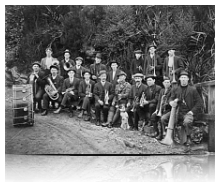 As a result a band of enthusiastic dedicated locals set about working to preserve Denniston’s heritage and interpret it in an effective way for the benefit of people making a pilgrimage to one of NZ's most infamous coalfield settlements. Recent works include restoration of some of the rail tracks in the yard area where the Coal Loading Bins were located, and this work also includes the restoration of a Genuine "Q" Class coal wagon, permanently moored to some rail track laid on the precipice that is the top ledge of the incline just as it drops down from the yard level onto the incline, thus giving visitors an insight what the incline would have been like in its operating days. A side trip to Denniston is always recommended, but will depend on the weather and you will need a car. You can access the settlement of Denniston by Road. At the top, you will find what is left of the once sprawling settlement, a few houses, the old school hall which houses the local museum, and a few other buildings as well as the rusting entrails and remnants of the town’s industrial past. In essence a good days outing if that’s what floats your boat! Coal is still mined in the area, at the Stockton coal field.